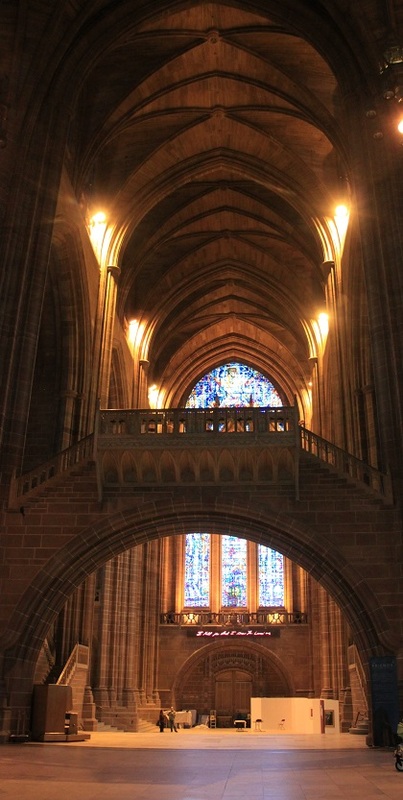 There’s an old Liverpool folk song which says, “If you want a cathedral we’ve got one to spare,” it’s not wrong. 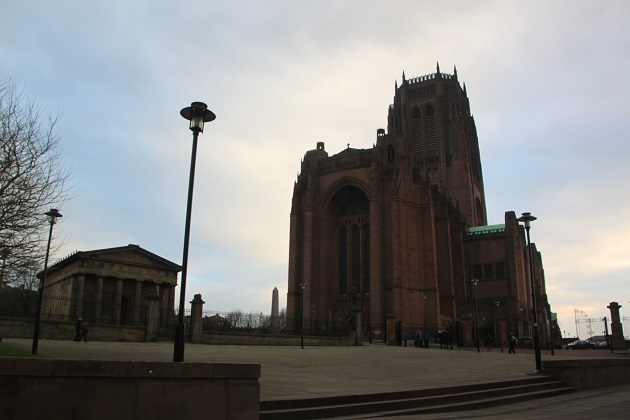 The city has two cathedrals which sit at either end of Hope Street – how cool is that! They are very different in every way – from the architecture and design of the buildings to the fact one is Roman Catholic and the other Anglican. 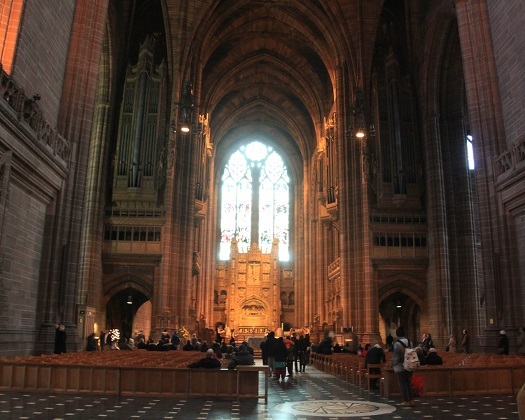 Having been to Liverpool many times, we have often spotted the Anglican Cathedral from afar, this visit we decided to pay it a visit. Not so far out of the city centre, an easy 15 minute walk, we strolled up the hill and were immediately struck by the vast size of this church. Having seen it in the distance, we really did not realise how huge it is up close. It is the largest cathedral in Britain and the 5th largest in the world. 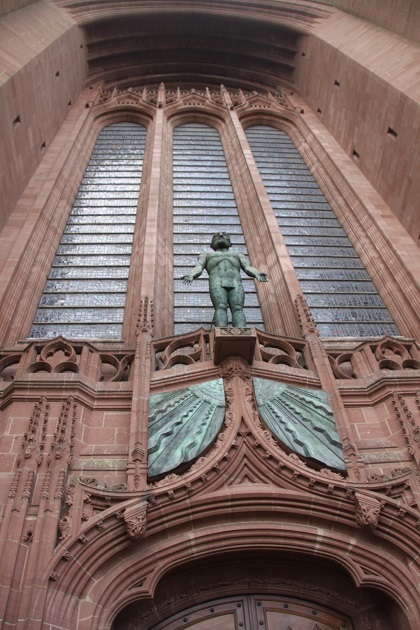 Built of brooding red sandstone, we again, in our ignorance, assumed it was really old, finished centuries ago. Much surprise then when we found out it was only completed in 1978. 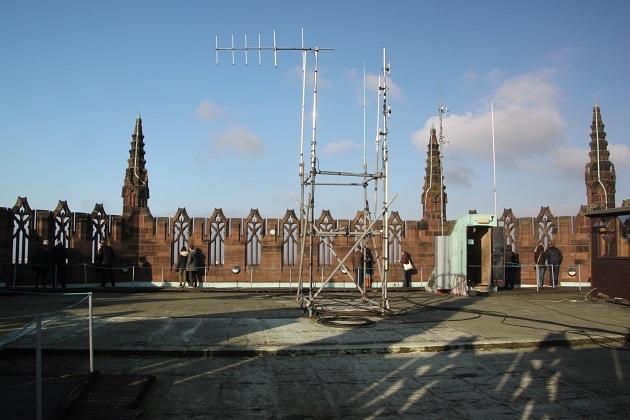 The building was designed by Giles Gilbert Scott, work started in 1904 and took 74 years to complete. Sir John Betjeman called it “one of the great buildings of the world.” I can totally see why. Inside we found a vast, airy, uncluttered space. Apparently Scott said, “Don’t look at my arches, look at my spaces.” There are many spaces to look at here. This was the last Gothic style cathedral to be built in the world and was dedicated in the presence of Queen Elizabeth in 1978. I was totally wowed by the impression of space and length. Apparently it is one of the longest cathedrals in the world. We arrived when the organ was playing, another impressive feature and another to stack up on the “most” list. It has nearly 10,000 pipes, the most found in any church. Son was most surprised to find an old red telephone box inside the church. Those telephone boxes were also designed by Giles Gilbert Scott as well as the power station that houses now the Tate Modern in London. Clearly not a man for small things. We bought our tickets to go up the tower and take the self-guided audio tour. It is free if you want to wander around but we opted for the full experience and at £5 each, I thought it was all very reasonable. 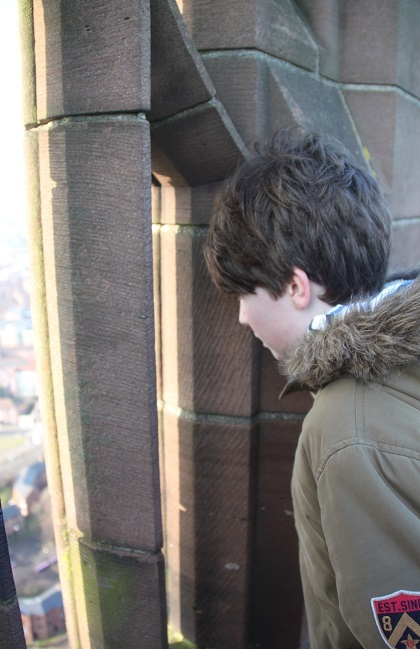 First we went up the tower. It is 330 feet high and thankfully this was one of the (rare) church towers where we didn’t have to climb a gazillion steps. Son was more than a bit impressed and relieved by this. We squeezed into two snug consecutive lifts followed by an easy 108 step climb. 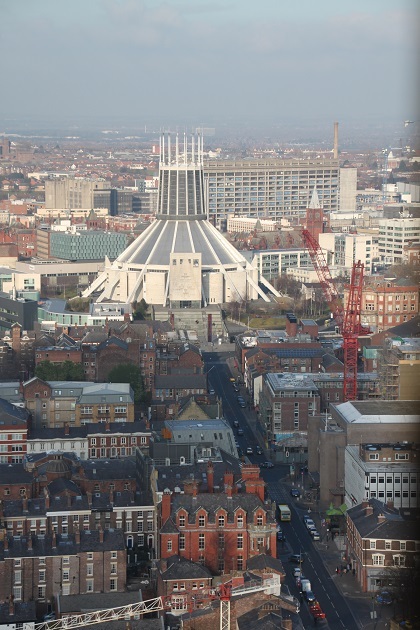 Views all over Liverpool and a perfect view of the Catholic Cathedral on the other end of the street. Husband was excited to spy the football grounds. Apparently on a clear day you can see to North Wales – we were not blessed with clear weather. We saw the huge bells on the way down, apparently the heaviest in the world and browsed briefly at a tapestry exhibition where we took in magnificent views down over the inside of the church. The audio tour was very interesting, no vast and lengthy history here though so it doesn’t take too long. Just as well, Son gallivanted from one thing to the next with the speed of a racehorse. 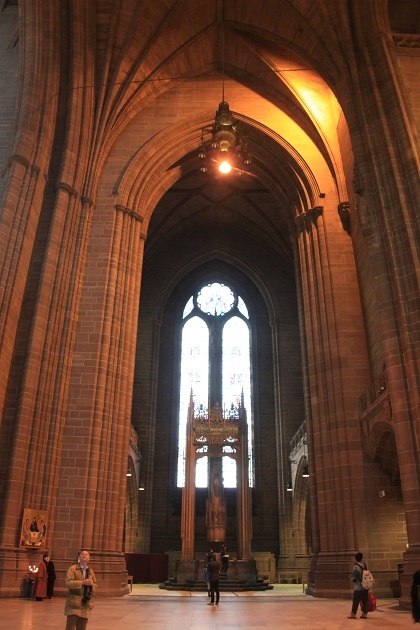 We had a look in the Lady Chapel and ended up watching the Great Space Experience – a 10 minute film about the cathedral and the city of Liverpool – just the perfect way to end a visit to this great cathedral. It is Erika, one of those places we’ve seen many times but never thought too much about it. Visiting and going inside was great but the view from the roof was incredible. Just goes to show you should never take places for granted!! That is so true! We mostly don’t even see them anymore the more we are used to them. Glad you explored it! Thank you for dropping by here and commenting!! That must be a cool place to live, close enough to the centre of everything Liverpool has going on!! a phone box inside the cathedral? 🙂 great! Definitely not what you expect to find!! We loved that. Great photos Joy of a most magnificent cathedral. I knew it was reasonably modern, but hadn’t realised how it looked so grand inside and out, with all its intricate stone work, just like many of its older cousins 🙂 I think Guildford Cathedral is of similar age, but that looks modern, and to me that’s quite boring, but Liverpool Cathedral looks amazing, even to a non believer! Never been to Guildford Cathedral and had no idea they were similar age but I love the fact this one looks old too!! The space inside and the architecture is just glorious. Gorgeous architecture, Joy. Is that true of all of Liverpool or was it just the cathedral? Very mixed George, some of the old buildings by the waterfront are stunning like this, there are a lot of modern buildings too and some well, let’s say just not so attractive buildings!! I love this place! I feel the need to go see it someday–it looks spectacular. And the bells have names? Where did the names come from, do you know? We have seen it so many times in the past but never made it inside. So glad we did now and I will be back sometime to explore again. I couldn’t resist the picture of the bells with names, no idea though where they came from!! So cool! And your photos are beautiful. Would love to make it to Liverpool someday. It’s such a great city, packed with history and culture, loads of fun stuff and that’s before all the music!! I love those biggest, highest, largest statistics! So easily challenged on a technicality! They seemed to be going for it everywhere here – statistics mad!! Beautiful! We recently visited São Paulo, Brazil and made a trip to São Paulo Catedral and it was breath taking. I can appreciate your pictures that much more! That must have been an incredible church to visit, would love to see Sao Paulo too…. one day!! What an impressive cathedral! I absolutely would never have guessed that it was built as recently as the 1970s. The gothic architecture looks authentic. It looks like a fascinating building. My father-in-law is a bell ringer so would be interested in those bells. We were totally convinced it was old with a lot of history. Talk about being wrong!! We didn’t hear the bells chime but I just couldn’t resist that picture with them all having names!! wow Joy! That is one BIG church…beautiful as well. lovely photos of the interior. It is huge Diana, deceptive really we’ve seen it from a distance before but up close – wow!! The inside is just gorgeous and such a lovely atmosphere. What a beautiful building. Interesting that the viewing area on top is so large as well! The viewing area is just great, normally in England they don’t let all and sundry up to places like this!! The views are superb especially on a nice day. That must be really impressive in person – the photos are amazing! 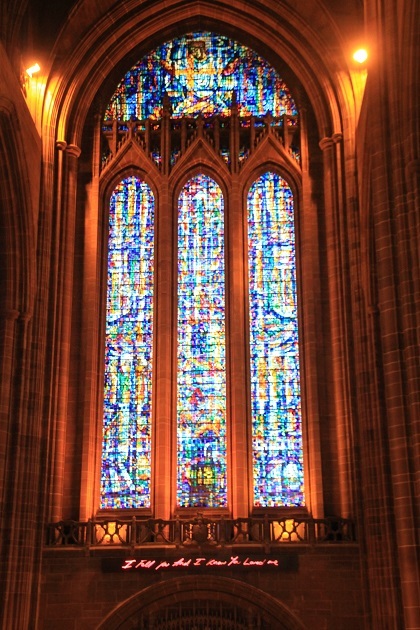 That stained glass…. wow! It is just gorgeous, inside and out! We did too – not what you expect to find right inside a church !! Joy, loved revisiting the Cathedral with you! We were there this summer and I was also surprised that it was not older! It is so huge, but we thoroughly enjoyed our visit and also loved Liverpool! Thanks for visiting again with us Pam!! Happy Thanksgiving, hope your day is a wonderful one. 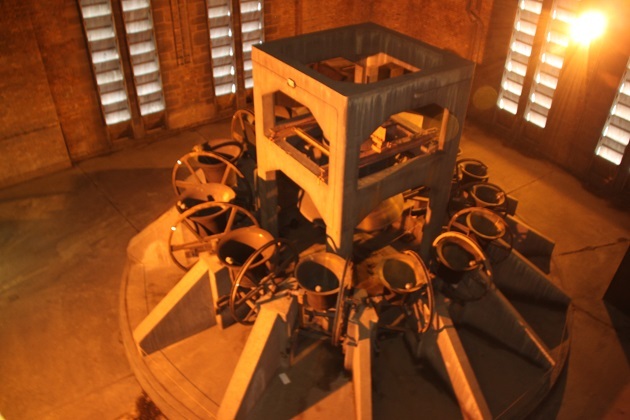 I love the phrase ‘brooding red sandstone’ – very nice, and I also love that they named the bells. It’s interesting that they’re all men’s names. 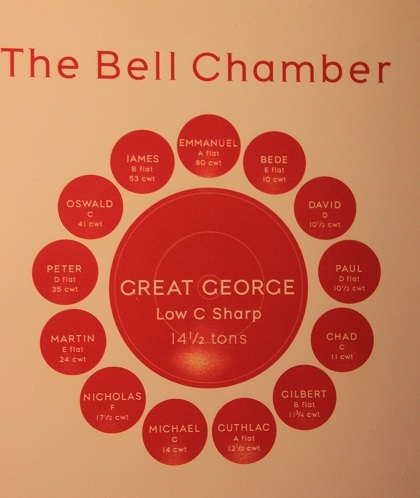 I loved the bells with names too – very cool!! The views could have been worse Rosemary for sure, we did get a lovely view of the city, nice from a different perspective. We’ve got family staying for the weekend so looking forward to that and our Christmas markets. Hope your weekend is great too!! Enjoy the Christmas markets – that is one thing I miss about not being in Europe at this time of year. Christmas should be cold!! Ha ha, a red phone box inside the Cathedral? How random! The views from the top are stunning. 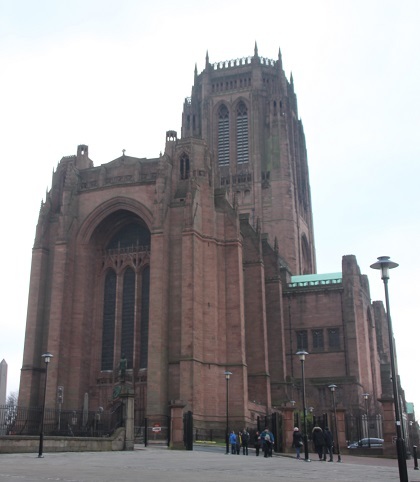 I never knew Liverpool had two cathedrals! They’re both really interesting and worth visiting as well, the views from the top of this one are fantastic and then that phone box – we just loved it!! Pick a clear day if you can – the views are even better!! 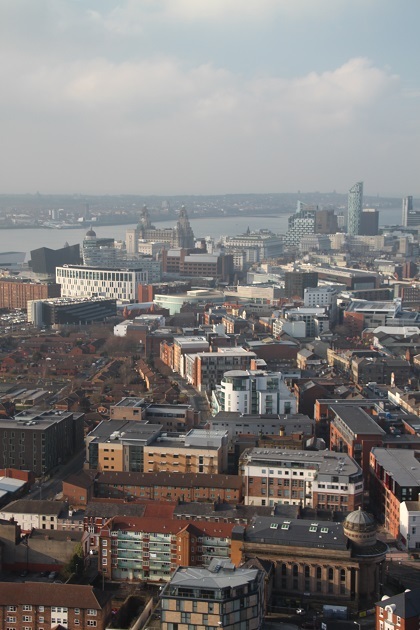 We pass through Liverpool several times a year to / from the ferry and have said several times that we want to spend some time there. This may be the catalyst to staying there longer! You definitely should Richard – there’s so much to see and do there! !